It would also be fair to say uneasy rests the rear that sits on an iron throne, but this blog post is about fashion not furniture. It’s time to talk about crowns. This article will be discussing characters and plot points from the first three seasons of HBO’s excellent series Game of Thrones. If you are caught up on the television show (or have read up through roughly 2/3rds of the way A Storm of Swords) then there won’t be any spoilers here. I am going to mention very small details from the books in the same timeframe as the show, but I promise, non-spoilery details. In the beginning of the A Song of Ice and Fire epic (in both book series and TV show) there is a king of the Seven Kingdoms, an uncrowned king in exile, and a northern barbarian who has declared himself King-Beyond-the-Wall. Then we lose some more kings. The television show is more or less on track with the books in regards to kings. The main difference is in the number of crowns. In the books, each monarch who participated in the War of the Five Kings had a unique crown. Actually, I am the King. I am prepared to debate the matter. Or stab you in the face. I’m deciding on one of these courses of actions. Stabbing is more appealing to me. Stannis Baratheon, the legitimate heir by blood wore a crown with a flame design, signifying his devotion (or at least, connection) to the fiery Lord of Light. I SO SO SO SO SO SO SO SO Want to be King! Totally So! Totes! 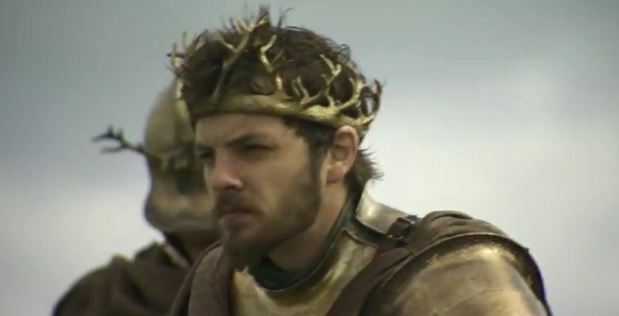 Renly Baratheon, who just couldn’t wait to be king, sported an impressive crown of antlers growing like vines. Robb Stark’s practical northern blacksmiths fashioned him an iron crown with a theme of sword points, fitting head gear for a king forged in war. No One Gives Me a Crown. I’ll Make Mine Out of Driftwood, Like a True Ironborn. And We Really Don’t Have Much More than Driftwood on these Scrabbly Islands. Finally, Balon Greyjoy wore a crown made of driftwood. 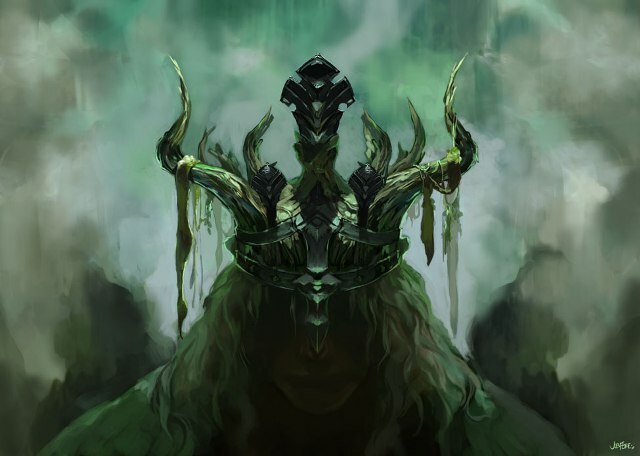 Like Stannis, this crown was a symbol of royal power but also divine power, a reference to the Ironborn Drowned God. Here the television show differs from the books. So, why is that? 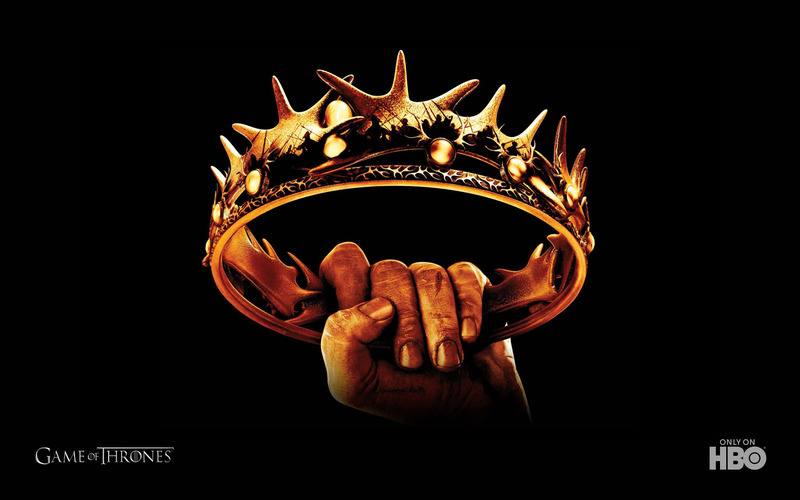 Why are most of the heads of state in HBO’s Game of Thrones missing a crown? It’s possible that the show-runners wanted to show that Balon, Robb, and Stannis had something to prove, and were delaying a coronation. 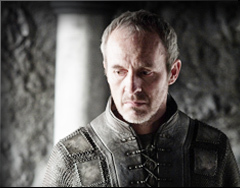 Television Stannis might not want to wear a crown until the entire realm actually agreed that he was king. He might have his heart set on having a coronation in the ancient sept of Baelor in King’s Landing. Because that would be the right thing to do. Renly, of course, is just super-eager to wear a crown, so he had a coronation and a celebration as soon as he could. Although these theories are somewhat plausible, I don’t buy any of them. There’s no evidence in the show that the characters have these kind of goal-centric motivations that are restricting them from wearing crowns. Instead, I think that the show-runners have decided that wearing crowns in lame. And that only lame kings wear them. The kings that wear crowns on the show are all somewhat less-than-stellar kings. 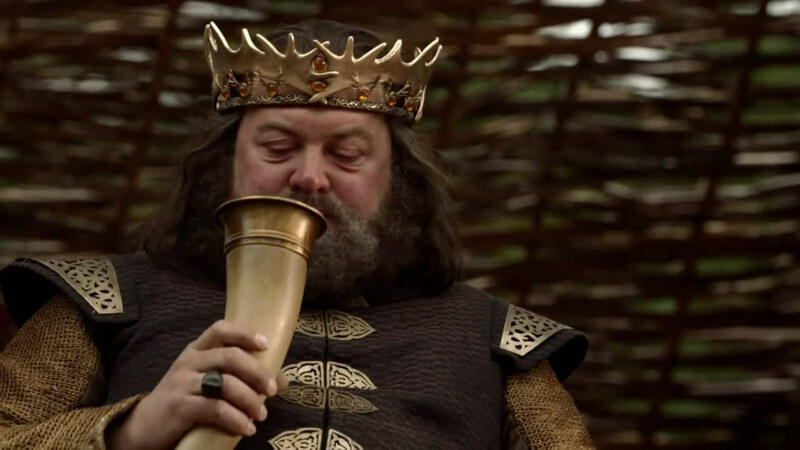 Robert Baratheon, although a brave man and powerful warrior, was an awful king. His excesses drained the kingdom’s resources and he turned a blind eye to shenanigans. When he died, he had so little legitimate authority that his dying wishes were ignored by his court, dooming Ned Stark. 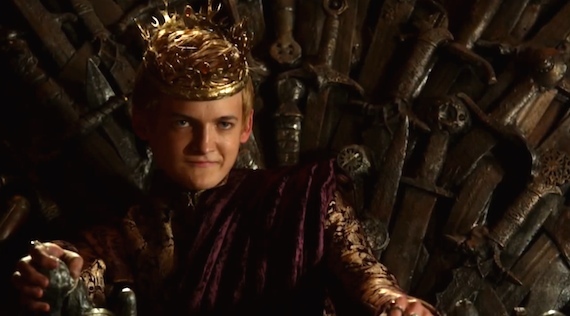 Joffrey Baratheon is a mad king in the making. Renly Baratheon was only briefly a king. And I just don’t like him. 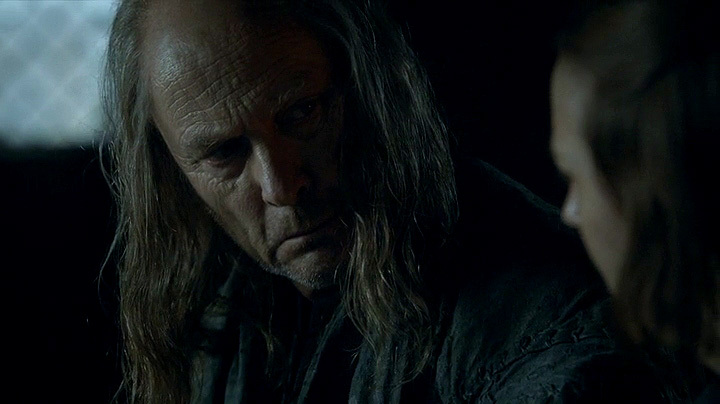 He had the chance to assist Ned but selfishly opted to pursue his own path to the throne, as a pawn of the Tyrells. The realm has already forgotten about him. The uncrowned kings are somewhat more impressive. 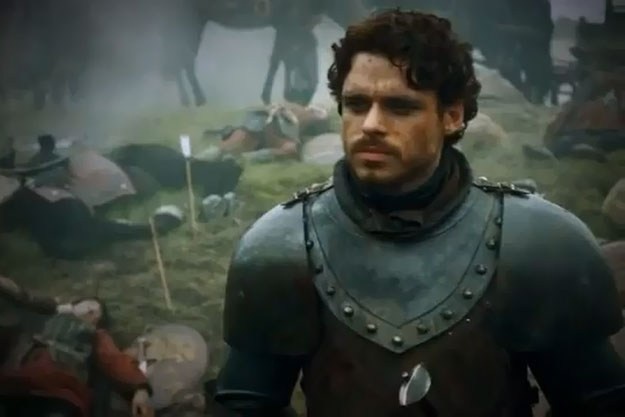 Robb Stark sadly made several bad decisions, but was super-kingly. Young, brave, handsome, charismatic, he was elected king by his men, who’d rather follow a King in the North than bow to some flowerly southern clown. He’s dead, but not forgotten. The North Remembers. Not convinced that Wearing a Crown == Not All That Kingly? Mance Rayder is King-Beyond-the-Wall, has an army on the move in the range of a hundred thousand. He united dozens of warring clans and peoples to follow him as their king, and the Wildlings notoriously don’t follow anyone. No crown on that head. Although to be fair, the only thing I’d want on my head would be something fur-lined. Dude, put on a hat at least! Viserys Targaryen, the beggar king, was so eager to get an army with which to take back the Iron Throne, he sold his sister into sexual slavery to Khal Drogo. He couldn’t be patient, and ended up with a golden crown. Where Does Daenerys Fit In With All This? Daenerys Stormborn, Mother of Dragons and Breaker of Chains hasn’t been shown wearing a crown. It’s not like she needs one. 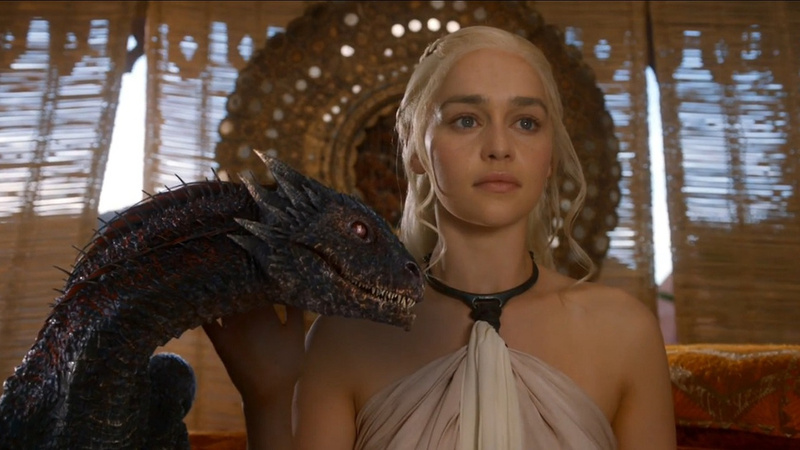 She has dragons. Obviously, I could be wrong. Next season, Balon, Stannis, and Mance all might be running around with amazing crowns. But I’m predicting that they won’t be. 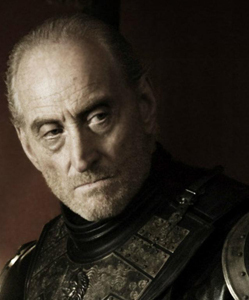 Tywin needs no crown. He’s in charge. 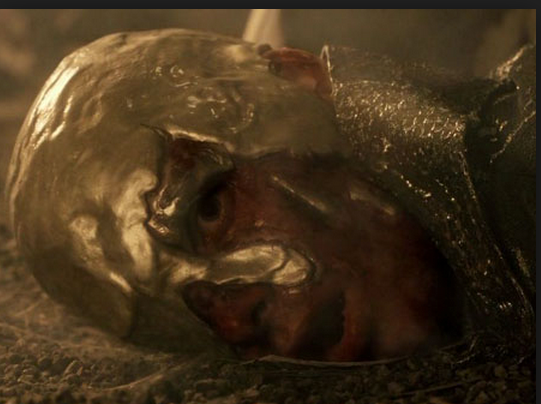 Images from HBO’s Game of Thrones, obviously. I make no claim to the artwork, but some claims to the non-Shakespearian text here, so there. Hey, thanks for the comments on my Website. I’m doing it for a A level prjoect but may continue it for the future, I have currently finished my coursework essay debating the women and sexism within Game Of Thrones, i will be posting it to the site soon enough if youre interested. Hey, thanks for the comments, and I’ll check out your essays when they get posted. No problem, I figured it must have been a misunderstanding. I’ve read the books, but I tend to try and only use TV show details, since that has some cross-pollination. I appreciate the compliment, thanks for reading my stuff. “Tywin is in charge. it is known” LOL this was very insightful and so true. Those who flaunt and wear the crown have proven themselves to be unworthy. I was rooting for Robb, but his family’s devotion to honor was their downfall! Having “guest” protection didn’t matter to Frey ugh! I hope he gets what he deserves! I could read/talk about Game of Thrones for hours! I really like this idea. Looking at the images, I think that wearing a crown somehow makes a guy look less intimidating. It would be good if the show runners really did have this in mind, particularly with your point that the less-than-great Viserys technically does get a crown of his own (still one of my favourite scenes). Thanks! It might just be me projecting my biases onto the show-runners (I think crowns look dumb, even if they do communicate the message that “Hey, KING here”) but it seemed weird to me that some of the kings went bare-headed in the show. By that, I mean Dany, for example, keeps adding territory whereas the Greyjoy’s aren’t planning on claiming more than their Viking-esque region. Just a thought. The driftwood crown does look silly. Only King Tommen looks sillier, maybe because the guy looks about twelve years old. Even so, the crown looks too small for him. Right! I mean, I’m cool with the symbolism of the driftwood crown, that the power of the Grey King comes from the sea, and the crown is a thing from the dry land that has been taken and returned by the sea… but the crown on the show. Ugh.